Mr. B and I have some goals that we are really working hard on achieving. We want to pay off our credit card debt, get the cars paid off and then, maybe, save for a real vacation. We've been pinching pennies and finding other ways to reduce our monthly bills. We just want to save money anyway that we can! I was trained at a very young age, by my mother, on how to create a bi monthly menu, read the weekly ads, and build a shopping list. Of course, that was many years ago and times have changed. In some cases, for the better! Gotta love technology! 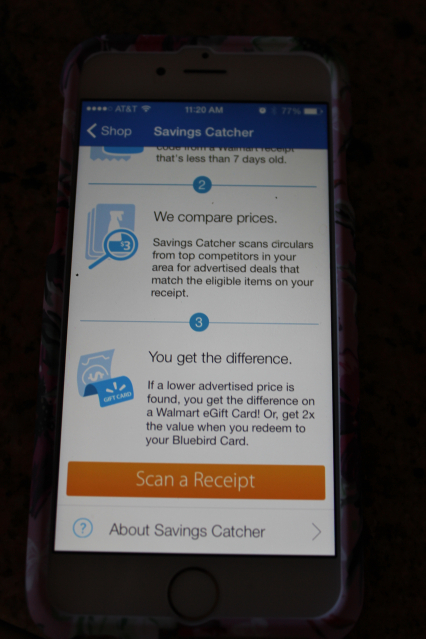 I was recently introduced to the Walmart Savings Catcher app for my phone! The Walmart Savings Catcher program eliminates the need for price matching! 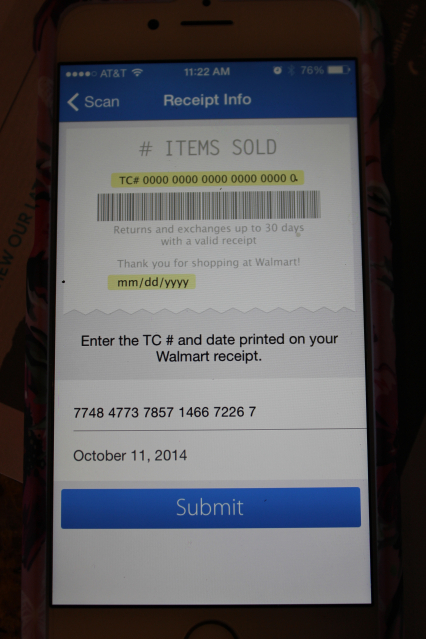 Simply download the Walmart app on your phone (you can also do this online if you prefer), shop like usual (with or without coupons) then, just scan your receipt. 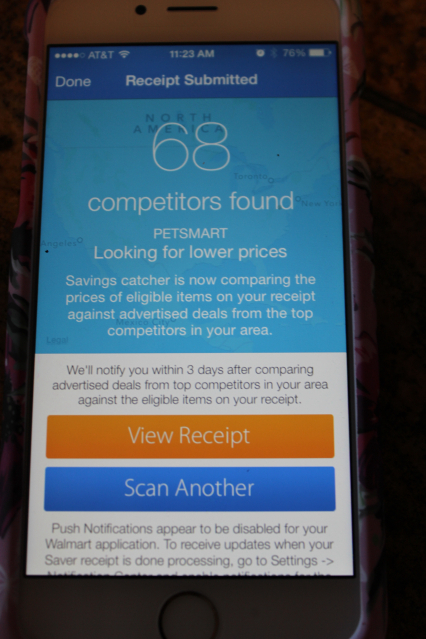 Walmart Savings Catcher will compare the prices for you! This process can take up to three days. However, if they find a lower local advertised price, you get the difference back in the form of a Walmart e-card that can be used the next time you’re in the store! And the e-card never expires!! I've been hearing from friends that have downloaded the app too and they are getting savings of up to $10.00 each shopping trip! That's easy money in my grocery budget that can be used to pay down other bills! Now I don't have to fill my purse with ads to take the store to try and price match. Walmart has taken all of that work away for me! Even if you don't shop Walmart all of the time, you may just find that even those small trips can add up to big savings! One thing to note, your receipt has to be less than 7 days old. You can submit the receipt either through the app or the website. For all the details (what can and what cannot be price matched) be sure to check out their Savings Catcher FAQ’s. If you haven't already, go get the app because, right now if you try it out and spread the word you’ll be entered to win a $2000 shopping spree at Walmart… and so will your friends! Enter it HERE. I never even knew about this app! Thanks for sharing, Kathe! Thank you for sharing this! The grocery budget has been stretched tight lately and this was the nudge I needed to check this app out! This is good to know. I just went there yesterday and noticed the signs and info about it and I was wondering what it was. Thanks! I haven't tried this yet, but I will! That sounds great. I wish some shop would take this kind of service in use also over here! Thanks for breaking this down. I saw it advertised at WalMart, but I didn't understand the point of it. I will definitely be downloading it now! the Canadian Consulate General visited the Statehouse for a tour while visiting the Patoka Tank Farm in Marion County.